Celebrate Fall & 'National Pumpkin Day' with some great pumpkin picking ideas, hay rides, mazes and more in the Huntington/Five Harbors Area and beyond. The giant pumpkin world record holder is Mathias Willemijns from Germany. Find your perfect pumpkin at this quaint wooded lot which sells Christmas trees in the winter. Hayrides are available as well as a child corn maze. Find Otto the Ghost and share your pictures. Find a great pumpkin, pick a spooky plant, enjoy the beautiful fall plants and animals, or meet the farm animals. Halloween sale, pumpkins and hay maze are tons of fun at this popular Huntington nursery. Choose from a wonderful assortment of fall plants and pumpkins. Also check for delicious goods from Jericho Cider Mill. Heritage Farm & Garden also has numerous related lectures and discussions related to fall gardening and plant care. Greet the large hay owl as you enter and enjoy choosing a pumpkin, the miniature hay maze or getting your picture taken in front of character backdrops. Enjoy pumpkin picking, hay rides, farm animals and even find Halloween decor. There is also a haunted mansion, 7-acre corn maze and Long Island’s largest straw pyramid. The Haunted Mansion and two other attractions become super spooky and are open from 7pm-11pm on certain days of the week. Choose your perfect pumpkin, enjoy a hayride and so much more! White Post Farm also includes great gifts and garden/home decor. Open daily with wine tasting, barnyard adventure, farm stand, pumpkin picking and more. Check all of their locations for special events and information. 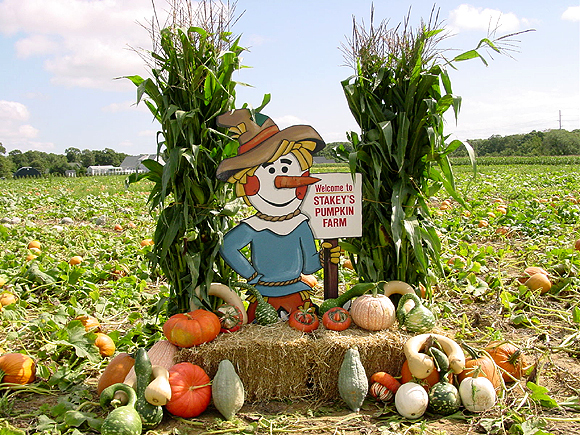 Helen's features U-Pick Pumpkins, fresh vegetables, mums, tractor & horse hay rides. Featuring hay rides, house-made jams, salsas and dressings, haunted corn maze and barn, hay pit and plenty other things to keep all members of the family happy. Located in Aquebogue, Stakeys has something for the whole family including a flower shop, pumpkin picking, hay rides, corn maze, face painting, snack shop and more.